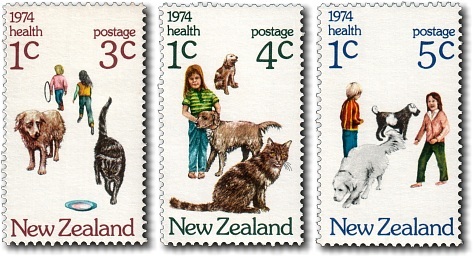 The 1974 health stamps featured children and their pet cats and dogs. The relaxed composition of elements on the stamps reflecting the relaxed and playful relationship between pet and owner. The concept of the stamps was to highlight the health benefits of owning and playing with pets.